While LA Unified is firmly committed to online credit recovery classes as a means to the district’s newly stated top goal — 100 percent graduation — Los Angeles charter school operators use these classes much more sparingly, as their graduation rates tend to be far ahead of the district’s. At three of the city’s largest charter management organizations, no more than 5 percent of students have taken an online credit recovery course. LA Unified has yet to report how many of their 2016 graduates used credit recovery to gain a diploma. A $15-million credit recovery program took LA Unified’s projected graduation rate from 49 percent last fall to an estimated 75 percent this summer, a record. The official graduation rate will be reported later this fall. The three CMO’s also have more stringent policies for testing out of a course. LA Unified allows students to test out of much of a course if they can score 60 percent on a pre-test. The charters set that bar higher or don’t allow testing out. “I strongly support the use of online learning, not just for credit recovery but for enrichment and for broadening the curriculum. That said, across all of our schools, only 1.3 percent of the course credits are provided through online learning,” said Caprice Young, who is CEO of Magnolia Public Schools and also a former LA Unified school board president. Last school year, as part of a $15 million program, LA Unified for the first time implemented a major push for online credit recovery courses across the district. The move was in response to a looming graduation crisis, as the school board raised the bar for graduation requirements and installed a series of courses called “A through G.” Students would need to take and pass the A-G courses before the end of their senior year, and if they earned all C grades or above would be eligible for admittance into California’s public universities, although the district allows D’s for graduation. The district was unprepared for the raised bar, so part way through the fall of 2015 the credit recovery program kicked in. This year the courses were offered as soon as school started. The dramatic increase in the graduation rate has turned some heads in the academic world, with some experts questioning the validity and rigor of online credit recovery courses. In that program, students without enough credits to graduate retake classes during free periods, after school, on Saturdays and during the winter break. 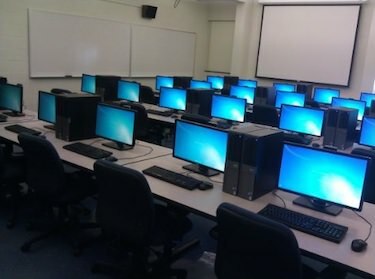 The courses are online and have either a teacher running the class along with a computer program, known as blended learning, or an all-online course known as virtual learning. If students prove proficiency with the material they receive a C grade at LA Unified. A’s and B’s aren’t an option. But LA Unified is not alone in using online credit recovery programs despite their controversial nature. Most large districts across the country also use them, as do at least three of the largest CMOs authorized by LA Unified, although each one appears to use them on a far more limited basis. And each CMO — PUC Schools, Alliance College-Ready Public Schools and Magnolia Public Schools — had a different set of guidelines regarding if students could pre-test out of some course material. “We most definitely use it very sparingly. It is not our goal to use it in place of intervention and support,” said Leslie Chang, superintendent of leadership and instruction for PUC Schools. PUC operates 16 schools, of which six are high schools. Chang said PUC used Apex Learning for its online programs, which is one of two companies that LA Unified also uses. Chang estimated that 4 or 5 percent of PUC graduates last year had taken at least one online course and said it was most commonly used when a student transferred into a PUC school already behind in credits. “If the child is behind and we determine that based on their current schedule they may need to take an additional course, then we will offer that option to them. We want to make sure it is not the go-to for everything that is required for graduation for our schools. Typically, a select few number of students will use the blended learning approach,” Chang said. PUC also has different guidelines on pre-testing. While LA Unified allows students to skip chapters or units if they pass at least 60 percent of a pre-test, PUC sets the pre-test bar at 70 percent. Young said she thought that LA Unified’s approach to online credit recovery will become more balanced in time. Magnolia operates eight independent charter schools within LA Unified, and four of them are schools for grades 6-12. “I think LAUSD is going in the right direction, and the next step is to get more nuanced in how they use it. This is pretty common when school districts implement online learning. The first year it may be overused or underused or inappropriately used, but as they get more nuanced about how to match the right kids with the right courses and the right content it makes sense,” Young said. Magnolia has an 80 percent pre-test bar and they use Fuel Education for their programs. Young estimated that 5 percent of Magnolia’s graduates last year took an online credit recovery course. “And that’s because kids don’t always start with us in 6th grade, they may come to us in their junior year and they are already behind and we have to help them catch up, and sometimes that requires them to essentially take more than six courses in the semester. Adding more online can catch them up,” Young said. Young also defended the idea of pre-testing. “One of the things that the online learning is for is at the beginning of each unit the student can demonstrate their knowledge, and then if they can demonstrate their knowledge that they know it, there is no sense in boring the student and making them retake it,” Young said. Perhaps the biggest reason the large CMOs use online credit recovery on a more limited basis is because they tend to be far ahead of the district in graduation rates. Magnolia’s graduation rate in 2015 was 96.4 percent. Alliance’s grad rate in 2014-15 was 95 percent, and PUC says they exceed 90 percent every year. With fewer students in danger of not graduating, fewer are obviously in need of credit recovery. “Graduation is what we do. It’s part of our DNA. It’s what we do. And it could be what LAUSD does too and hopefully they will,” Young said. Robert Pambello, an area superintendent for Alliance College-Ready Public Schools, said Alliance’s use is “very limited. Every student has a graduation plan, and so we track students on a regular basis for being on track for graduation, and there are very few kids that actually need the credit recovery.” Alliance is LA Unified’s largest CMO and operates 28 schools. Eighteen of them are high schools. Pambello said less than 3 percent of Alliance’s graduates last year took an online course and that Alliance does not allow pre-testing. Not every large CMO is as centrally organized with its online curriculum as PUC, Alliance and Magnolia. Green Dot Public Schools, which manages nine high schools in Los Angeles and Inglewood, has online credit recovery programs but does not centrally track how many students are taking them. The courses are viewed no differently than its regular curriculum, according to Sean Thibault, communications director for Green Dot. Pacific Palisades Charter High School is not a CMO but a standalone independent charter school. While it also offers credit recovery, like Green Dot it does not centrally track how many students are taking the courses. The school has been offering online credit recovery courses for five years during summer school, but this year it also began offering them throughout the school year as well. Like LA Unified and the large CMOs, the online courses are overseen by a licensed teacher. “We do not know (how many take online credit recovery). We don’t track it in that way, because when the student passes the course, because it has a highly qualified teacher running it, it doesn’t have a separate designation,” said Jeff Hartman, director of academic planning and guidance. Palisades does not allow for any pre-testing out of chapters or units. Randy Tenan-Snow, an English teacher at Palisades who helps oversee online credit recovery, predicted the school will be expanding its program in the coming years. *UPDATED to reflect PUC operates six high schools, not four.